If you are planning on building structures for your home or your business in Los Angeles, always remember that there may be extensive costs that you have to incur to ensure proper air conditioning for your home or place of business. You want affordable rooftop units in Los Angeles for your structure. Rooftop units are systems used to condition and circulate air in a building as part of heating, ventilating and air conditioning. Installation of these rooftop units is a great step towards achievement of a household comfort. However, saving a bundle of cash is another thing. Root top units have been known to be very expensive. This may cause you draining so much cash into it. When buying roof top units for your home or your place of business, there are a few tips you will have to consider before shopping for the rooftop units. First, you will have to consider the type of rooftops suitable for your house. There are 3 main types of systems you can go for depending on the structure of the building on which you want to install the roof top units. These types include: split systems, mini systems and the package system. In a split system, the compressor is placed outside while the air handler is placed in the inside. 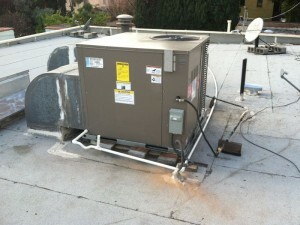 For the package system, both the air handler and the compressor are located in the same place, the roof. The mini split system is recommended for homes that do not have the ductwork. At this point you may be confused on the best system to settle on. Before making a decision, consider making inquiries from experts. They will help you on settling on units that are suitable and affordable for your home or business apartment. After settling on the type of units to install on your building, consider the sizes too. This depends on the structure of your building. Installing small units on big buildings may not be efficient enough. This may lead to mechanical problems due to the large load for the small equipment. This will be very expensive on your part because you will be incurring extra expenses or repairing the roof top units. Hiring a cooling contractor will help you in evaluating the different sizes and settling on the most efficient affordable size for your building. You will also need to consider the installation costs. Buying affordable rooftop units may become expensive if you hire a contractor that charges too high for the installation. Choose the installation contractors wisely to keep much cash in your wallet for other important activities. Choose American Cool and Heat today!